My Great granddaddy “Chief” Bradford was born with the green gene, with a real knack for mixing, tinkering, and improving the crops on his farm. His passion, though, was for his “Bradford” watermelons, known far and wide as the sweetest and most flavorful around. It was the finest watermelon for making pickled rind, too, spoon tender right down to its dark green skin. It was this tender skin, undoubtedly, that made it nigh impossible to ship, and so it never roamed far from our family fields. He always planted the Bradford late and had developed in them strength to fend off the diseases that tend to plague the cucurbit family at the end of the summer. Everyone else was out of melons by the time his started coming in, so if you wanted a watermelon you had to see Chief. He taught my Granddaddy everything about growing and preserving the Bradford watermelon line. From him the seeds and knowledge were passed down to my Dad, and finally to me. That’s the story the way I knew it until the summer of 1998. Fortunately, I inherited my Great granddaddy’s green gene and his passion for watermelon that in a roundabout way led to a career in landscape architecture. In the spring of 1997 while doing research for an internship I had in Pennsylvania, I came across a book from the 1850’s that chronicled the best vegetables and fruits of that time. Of course, I quickly flipped to the section on watermelons, several of which were listed as being far more superior to any market melon of that day. Of those listed, the author distinguished one as being the absolute best, and to my surprise it was called Bradford, and originated in the central portion of South Carolina! My Bradford family had been in the heart of South Carolina since before the American Revolution. 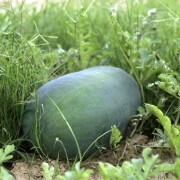 Could this Bradford watermelon of the 1800s be the same as our Bradford watermelon? I would carry this question unanswered for the next 14 years. One sleepless night I sat down to the computer and began searching for anything Bradford watermelon related. 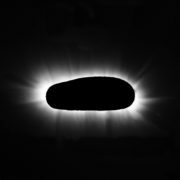 Eventually, I came across a site called American Heritage Vegetables by Professor David Shields at the University of South Carolina. 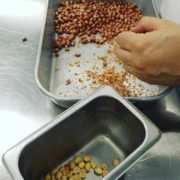 David’s passion is reconnecting with old heritage vegetable varieties that shaped our food system into what it is today. 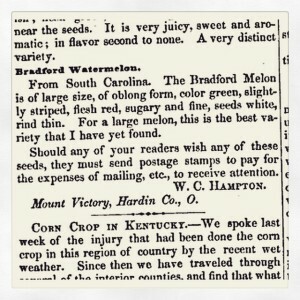 His section on watermelons listed the same varieties that I had seen in the 1850s book including the Bradford watermelon. Could David possibly solve my watermelon mystery? I sent him an email in the middle of the night explaining my story and requesting his insight. By early that morning I would have my answer. 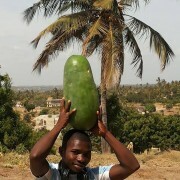 Indeed they were one and the same watermelon! 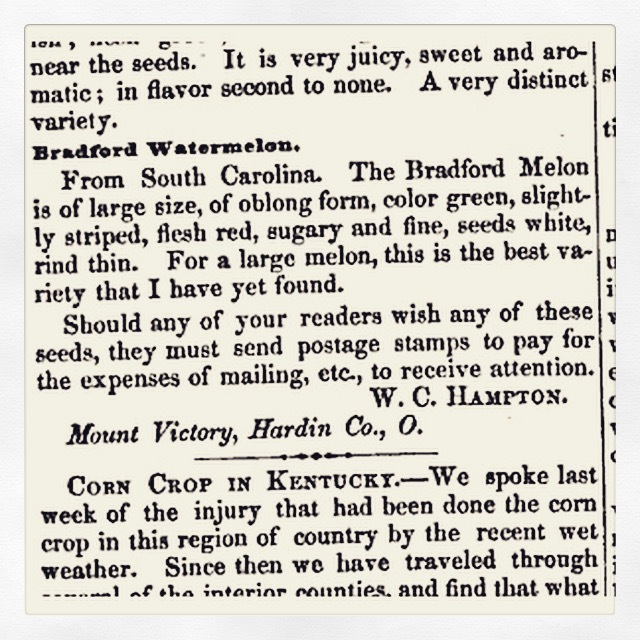 It was my namesake, Nathaniel Bradford, my sixth Great Grandfather that bred the Bradford watermelon, preserved undetected for 170 years in my family’s fields, and believed to be extinct for around a century. David was able to finish the story. 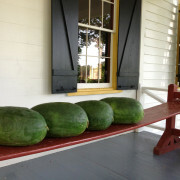 Nathaniel had shared seeds of the perfected watermelon with some well-connected and successful seedsmen in the early 1850s. From those seeds a very profitable commercial line developed and soon became the most popular and widespread watermelon of the 19th century in spite of its resistance to shipping. By the early 1900s, however, watermelons had been developed with hard, thick skins and tough rinds at the sacrifice of flavor, which were ultimately more profitable because they were able to be shipped stacked many layers deep on railroad cars with very little breakage. Thus, no longer was the ambitious farmer relegated to marketing his melons to his locale. And so the greatest watermelon to have come from that great age of watermelon breeding, the Bradford watermelon, fell out of cultivation and became lost to the annals of history. However, although the commercial line disappeared, my family never stopped growing the original watermelon. Armed with an amazing story, an insatiable desire to farm, and the heritage seeds of quite possibly the best watermelon ever created, I did what came naturally. 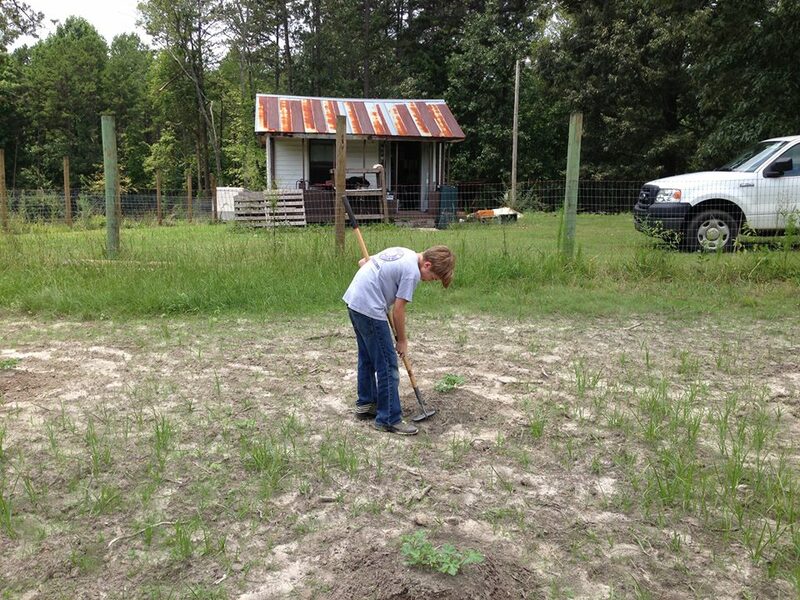 I planted the biggest field of Bradford watermelons our family had ever grown…a half acre. 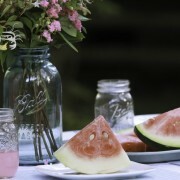 It may not sound like much, but it was quite risky when the last seeds of Bradford watermelon on the planet could be contained in a couple of mason jars! 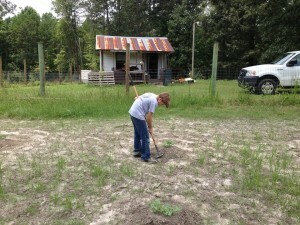 My oldest 3 sons and I planted six rows of watermelons—220 hills with 2 plants per hill for a total of 440 plants. 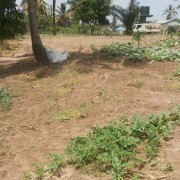 If we had a perfect yield we would get one big melon per vine. Harvest would be in about 3 months, and I suddenly needed to come up with a plan to move the crop. Being a full time business owner, I needed to focus on a simple way to move the entire crop quickly, without taking too much time from my business. So I made plans to make watermelon molasses and my Grandmother’s watermelon rind pickle, as well as save all the seeds. A portion of the proceeds would go to our cause Watermelons for Water. And our crop had better than a perfect yield! 465 big, beautiful watermelons were harvested off of 440 plants. That was a tremendous blessing especially for this cold wet year when so many others suffered greatly reduced yields or no yield at all. Watermelons for Water was a huge success, too. 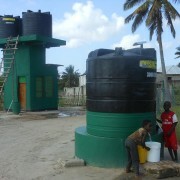 We were able to raise enough money to impact the lives of 12,000 people in need of fresh water and medication. It was a beautiful experience for my family and me, especially to see my young sons work so hard and selflessly to help people whom they never have met.